Sewage system blockages and rise in groundwater level have been cited by some environmental experts as the main causes of flooding in Nigeria. Fast Forward to 2018, two government agencies, NIHSA and NEMA have raised alarm that there is an impending flood as the downpour increases in the days ahead. Mr. Eze of NIHSA revealed that as at Friday, September 7, 2018, the height of River Niger in Lokoja was 10.1 meters as against the 9.7 meters in 2012, adding that it continued to rise on hourly basis. A day after the timely flood alert and warning was issued by NIHSA and NEMA, we heard that in Jigawa, six people were feared dead and several others displaced due to flood. Also in Kogi, Kwara and Edo, farmlands and personal effects were destroyed. Earlier this month, Niger State recorded 14 deaths due to floods since the rain began this year. The days ahead would tell how these states and others would farein the battle for escape from nature’s fury. It is against this backdrop of recent floods in the country that we remind ourselves of the need to be ready for the peak of the rainy season. Put simply, flood is having too much water in the wrong place. The causes are clear. Sewage system blockages and rise in groundwater level have been cited by some environmental experts as the main causes of flooding in Nigeria. The Director General of NEMA, Engr. Mustapha Maihaja, said, “We are causing much of the adverse weather as we fell trees in multiples but fail to replace any, and you know that trees use up our carbon dioxide and give up oxygen to breathe. The felling of trees without replacement leaves more carbon dioxide in the atmosphere which causes Ozone depletion. This simply means that the iceberg separating the sun from having direct impact on the earth causes rapid melting of the ice from above, while excess carbon dioxide from the earth also enhances rapid melting of the ice from under. The peak of the rainy season in Nigeria is here and from experience, it comes with an attendant flooding. 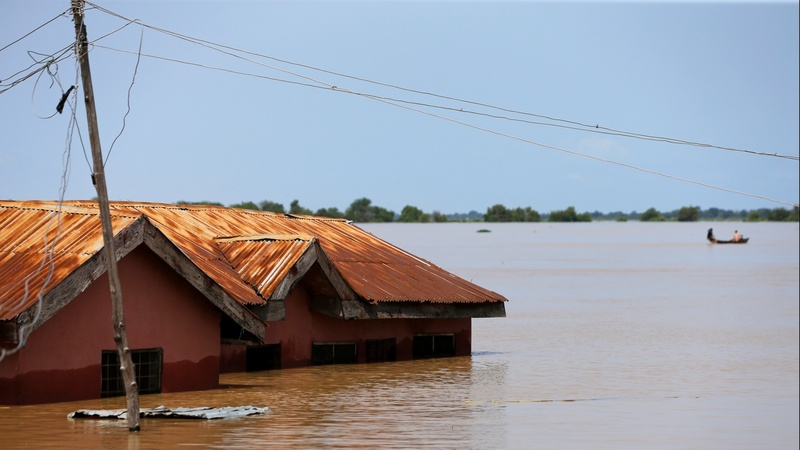 NIHSA, NEMA and Nigeria Meteorological Agency (MiMet) have all raised red flag warnings for everyone to brace for serious consequences advising flood-prone residents to vacate the areas. With just few days of rains in this peak period of rainy season, shortly after the August break, houses have been submerged, farmlands inundated and lives already lost to floods in some states like Jigawa and Niger. Kogi, Kwara and Edo have also been tormented by the flood menace with its sorrowful lot. National Orientation Agency (NOA) and NEMA are duty-bound to sensitize Nigerians on how to manage disasters and flood, and be disaster-resilient. Other government agencies saddled with disaster management are urged to double up in ensuring safety of lives during emergency. Proactive measures taken by everyone now will go a long way in getting us ready for the predicted flood.